A statue of a girl symbolizing victims who were sexually enslaved by Japanese troops during its occupation of the Korean Peninsula (1910-45) was erected in Germany's southeastern municipality of Wiesent on Wednesday. The erection ceremony of the "comfort women" statue was held at the Nepal Himalaya Pavillon, a park in Wiesent, which is part of the district of Resenburg. It was attended by some 100 local German officials and representatives from the Suwon City government and civic groups from South Korea. Some 200,000 Asian women, mostly Korean, are estimated to have been forcibly taken to front-line brothels for the Japanese army during the war. They are euphemistically called comfort women. 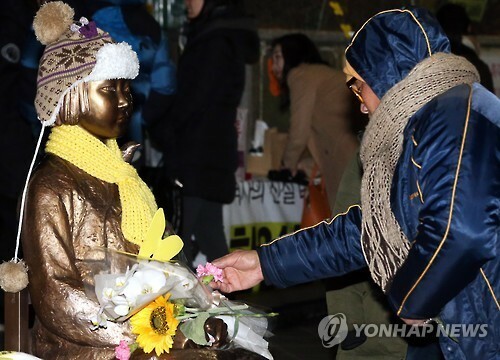 The city of Suwon, south of Seoul, reached an agreement with the German municipality to erect the statue, a replica of a life-size bronze statue that was first introduced in December 2011 in front of the Japanese Embassy in central Seoul. The statue in Seoul was produced to mark a local civic group's 1,000th weekly rally against the Japanese government. Participants of the on-going rallies demand an apology and compensation over the wartime atrocities committed by the neighboring country. There are currently over 40 comfort women statues erected in and outside of South Korea, including in the US, Canada, Australia and China. Ahn Jeom-soon, a 90-year old former South Korean comfort women, made a meaningful visit to Wiesent to witness the first comfort women statue set up in Europe. Suwon city had initially struck a deal with the German city of Freiburg last July to set up a comfort woman statue in that city.